Rambling Moose: So THAT'S what the Snails in the Candy Box look like! 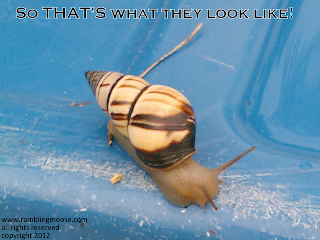 So THAT'S what the Snails in the Candy Box look like! I see these shells everywhere. Abandoned homes stuck to signposts, mailboxes, and other stationary objects. Silent sentries to a life once lived below the notice of everyone. I do not know what they're called, just that they're common here in Florida. I finally saw one alive. It was in the middle of the deluge that was Tropical Storm Debby. Climbing for high ground on top of a recycling bin, this small fingernail sized creature was exploring. In six years of living on the sand bar that is South Florida, this is the first time I have seen one. Usually I hear them as they become one with the pavement and my shoe at the night time dog walk on a poorly lit sidewalk stroll. Those and their much larger Apple Snail cousins. Trust me, if they were edible, South Florida could easily become the culinary capital of Escargot. They may be, but since I see what they spray on lawns here, it's best to find your protein elsewhere. It did occur to me as I looked at this random picture on my laptop blown up to many times larger than normal, I had seen them before. In the soft focus of the zoom, the last time I had seen one came to mind, or rather tasted one. Those higher end chocolates that you get in a gift box have a piece that looks quite a lot like this. In fact, I tend to reach for those quicker than some of the others in an assortment. This isn't praline filled, it's gone on to live out its life on the street behind mine. Climbing around slowly, just caught for a glimpse and now going back into its unremarkable existence. Unnoticed by most and shared here by me.